Going to sleep with a clean face is one of my non-negotiable life rules. Whether its from stress of breaking my rule or simply bacteria lingering, I WILL awake with a beautiful blemish somewhere on my skin if I don't get it all off before bed. Now, they key is finding an easy and effective way of doing this. 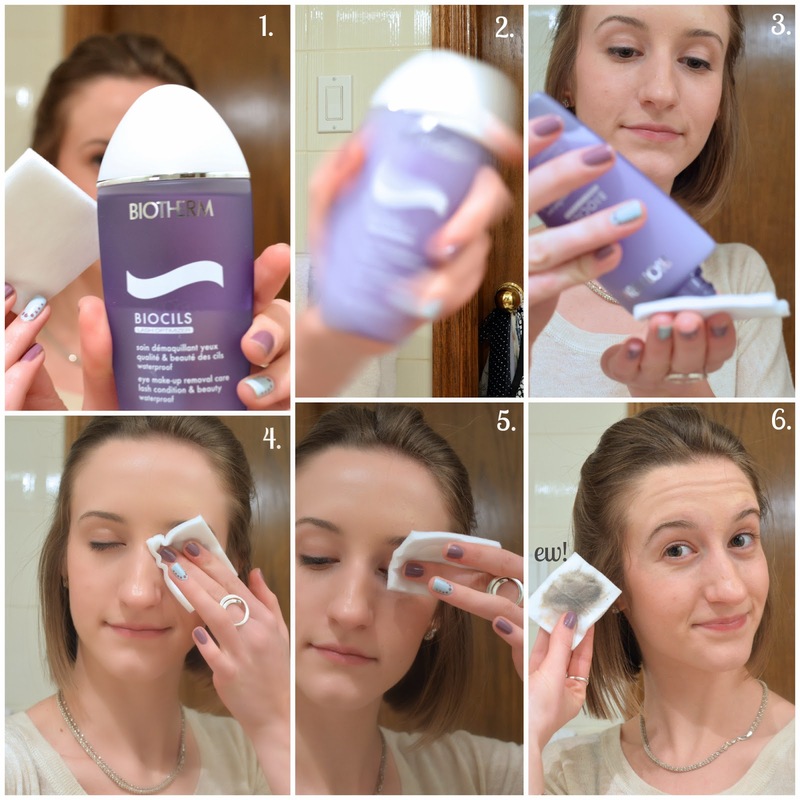 I've been loving the Biocils Lash Optimizer eye makeup remover from Biotherm. They key when looking for an eye makeup remover is finding one which is "two-phased", with both oil and water components. This means that the product will dissolve waterproof makeup without leaving an oily film. This remover from Biotherm specifically cares for your lashes, limiting their fall out and leaving them conditioned. That deserves a big hoo-rah in my opinion. I have LOULOU Magazine to thank for introducing me to Biotherm's gentle makeup removing options. Life changers right here. 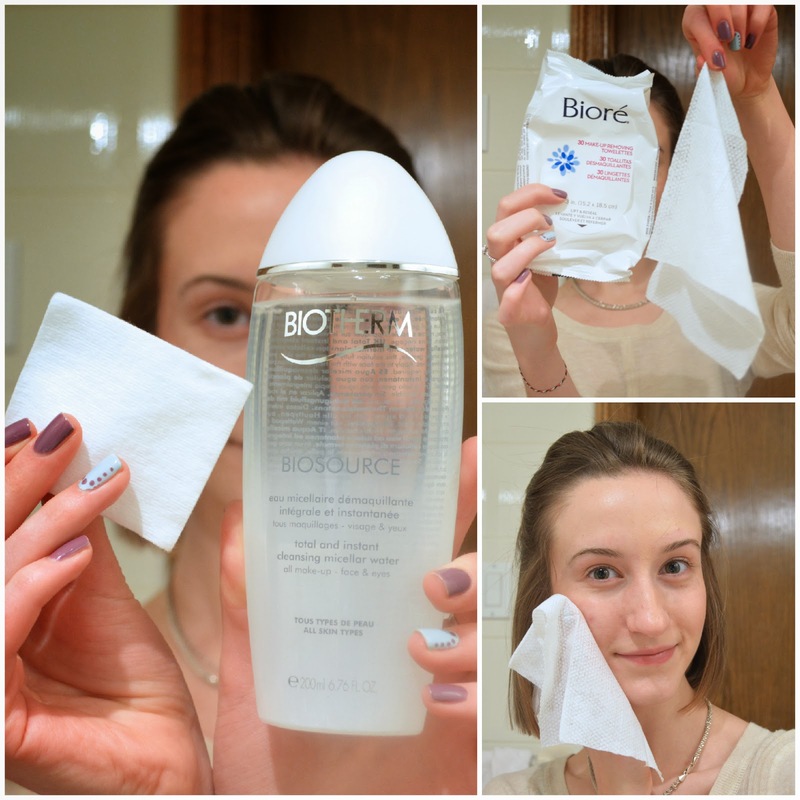 Read on to see how I use the Biocils Makeup Remover, along with other products. I am also a big fan of the Shiseido cotton. One bag of 165 squares is $10 and you can find them at Shoppers Drugmart or Sephora. They are pretty much designer cotton pads. Definitely a princess product, but much higher quality than regular cotton. One pad holds up strong for both eyes and doesn't leave those horribly annoying cotton fibres on your face. I also love using one of these cotton pads for removing nail polish- one lasts for both hands or both sets of toes! Impressive. If you are having a lazy day, these Biore face wipes work great and are a bit exfoliating due to their textured surface. The two steps of eye makeup remover and micellar cleansing solution take just a few minutes to complete and leave my face feeling fresh and clean. I always follow up with a face cleanser, which is frequently the Froosh Go Deep tea tree wash. Take note that if you decide to use face wipes, I would not recommend using them to remove eye makeup since the fragrance and slightly rough texture of the cloth could be irritating to the delicate eye area. It's very true though, such a satisfying feeling getting all the gunk off after a long day. Very nice makeup posts yourself, beautiful eyeshadow!